Many findings support a possible association between gastroesophageal reflux disease (GERD) and asthma in children, but there is not enough evidence to support the causality of this association. Longitudinal studies with long-term follow-up are urgently required to cover the many gaps that persist in this area. Treatment of GERD with proton pump inhibitors (PPIs) in children with uncontrolled asthma does not substantively improve asthma outcomes but large, controlled trials in children symptomatic of both asthma and GERD are lacking. Since there are significant safety concerns for long-term PPIs use in children, physicians should carefully balance their therapeutic decisions in individual cases. Fernando Maria de Benedictis, Anna Maria Tocco and Giuliano Lombardi have nothing to disclose in relation to this article. No funding was received in the publication of this article. Compliance with Ethics:This study involves a review of the literature and did not involve any studies with human or animal subjects performed by any of the authors. Gastroesophageal reflux (GER), the intermittent ascent of acid contents into the oesophagus, is a normal physiological process. In contrast, gastroesophageal reflux disease (GERD) is present when the reflux of acid contents causes troublesome symptoms and/or complications.1 Asthma and symptomatic GER are both common disorders in childhood and symptoms of GER are frequently reported among children with asthma.2,3 Historically, respiratory manifestations have been recognized as a potential consequence of GERD, and the relationship between asthma and GERD has been largely debated in the literature. The aim of this article is to critically review the nature and the clinical aspects of this association in childhood and shed light on one of the most controversial fields of respiratory medicine. Exploring the relationship between asthma and GERD in children is hampered by many shortcomings. A global, evidence-based consensus on the definition of GERD in the paediatric population suggests that GERD be defined by using a “patient-centred symptom-based” method.5 However, symptom-based criteria for GERD have significant limitations in children, because reporting of symptoms may be unreliable until the age of eight years.5 Furthermore, asthma and GERD may have similar symptoms in childhood, such as nocturnal cough, chest tightness and exercise-induced discomfort, thus making difficult to determine which children actually have GERD.6 Children and adolescents with GERD more commonly manifest cough and other respiratory symptoms than the typical oesophageal complaint of heartburn in adults.7,8 Indeed, in a recent study in children with poorly controlled asthma, no gastrointestinal symptom differentiated those with and without GER identified by oesophageal pH monitoring.9 Taken together, these findings emphasise that the prevalence of GERD in asthmatic children identified in studies that used symptom scores as inclusion criteria and/or endpoints is likely biased by the inability to differentiate symptoms of asthma from those of GER. The majority of studies that examined GERD in children with asthma reported oesophageal pH measurement. However, these studies often selected a reflux-index threshold that was lower than that required by evidence-based guidelines, which possibly led to an overestimation of the prevalence of reflux in patients with asthma. On the other hand, pH-metry is limited by the inherent inability to detect non-acid reflux. From a clinical point of view, the temporal interdependence between GERD and asthma is an important proof of concept for a causal relationship. This aspect was investigated in three cross-sectional studies that assessed whether respiratory symptoms (wheezing, cough) followed episodes of GERD.10,11,12 These studies failed to show a consistent relationship between respiratory symptoms and periods of abnormal oesophageal pH or reflux symptoms, thus underlying that the association of GERD and asthma cannot necessarily be causal, but is rather due to chance alone. The pathophysiological relationship between asthma and GER has gained much attention by pulmonologists, gastroenterologists and physiologists over the years. The available evidence does not yet clearly indicate whether GER precedes and/or triggers asthma, or asthma precedes and/ or triggers GER. It is, however, likely that each one of these conditions may act as aggravating cofactor of the other. • stimulation of pH-sensitive irritant receptors in the distal oesophagus may both elicit bronchospasm and increase airway hyperresponsiveness through cholinergic pathways (reflex theory). Much of the confusion around the role of GERD in asthma is likely due to the high prevalence of these two conditions in the general population.16,17 In their clinical approach, physicians should keep in mind that asthma and GER may coexist independently. The respect of this principle may avoid misinterpretation in the evaluation process and inappropriate therapeutic decisions as well. The differentiation between acid and non-acidic reflux regarding respiratory symptoms may be important. Preliminary data suggest that non-acid reflux may result in respiratory symptoms.24 The possible role of non-acid reflux in worsening asthma control is unclear and larger, well-controlled studies are needed to validate this hypothesis. The data showing no effect of acid suppression on asthma outcomes in children should not be generalised into treatment of GERD. The approved dose of PPIs may not have achieved adequate acid suppression in all children. A recent double-blind, placebo-controlled trial to investigate the effect of esomeprazole 40 mg once or twice daily on asthma outcomes in adult patients with symptomatic GER revealed that both active doses were effective, but only esomeprazole 40 mg twice daily demonstrated a significant improvement in forced expiratory volume in one second (FEV1).25 On the other hand, studies on PPIs using impedance measurements have failed to prove any effect of these drugs on nonacidic reflux.26 Supplemental therapies including pro-motility agents with effects apart from acid suppression have not been widely studied in children with asthma and GERD. Many findings support a possible association between GERD and asthma in children. However, there is not enough evidence to support causality. Several gaps and areas of deficiency are still present, and they urgently require new studies, especially those with long-term follow-up. When approaching a child with asthma and suspected GERD, physicians should balance their therapeutic decisions in between science and ethics. At one end, there is the principle that any correct treatment presupposes both the respect of epidemiological data and the knowledge of the pathophysiological mechanism(s) underlying the symptoms. At the other end, it should be never forgotten that treating the patient – in this case a child – and not the symptoms, remains the main principle at the heart of medicine. 1. Vandenplas Y, Rudolph CD, Di Lorenzo C, et al. ,Pediatric gastroesophageal reflux clinical practice guidelines: joint recommendations of the North American Society for Pediatric Gastroenterology, Hepatology, and Nutrition (NASPGHAN) and the European Society for Pediatric Gastroenterology, Hepatology, and Nutrition (ESPGHAN),J Pediatr Gastroenterol Nutr, 2009;49:498–547. 2. Field SK, Underwood M, Brant R, et al., Prevalence of gastroesophageal symptoms in asthma, Chest, 1996;109:316–22. 3. Hancox RJ, Poulton R, Taylor DR, et al., Associations between respiratory symptoms, lung function and gastrooesophageal reflux symptoms in a population-based birth cohort, Respir Res, 2006;7:142. 4. Thakkar K, Boatright RO, Gilger MA, et al., Gastroesophageal reflux and asthma in children: a systematic review, Pediatrics, 2010;125:925–30. 5. Sherman PM, Hassall E, Fagundes-Neto U, et al., A global, evidence-based consensus on the definition of gastroesophageal reflux disease in the pediatric population, Am J Gastroenterol, 2009;104:1278–95. 6. Blake K, Teague WG, Gastroesophageal reflux disease and childhood asthma, Curr Opin Pulm Med, 2013;19:24–9. 7. El-Serag HB, Gilger M, Kuebeler M, et al., Extraesophageal associations of gastroesophageal reflux disease in children without neurologic defects, Gastroenterology, 2001;121:1294–9. 8. Andze GO, Brandt ML, St Vil D, et al., Diagnosis and treatment of gastroesophageal reflux in 500 children with respiratory symptoms: The value of pH monitoring, J Pediatr Surg, 1991;26:295–9. 9. Holbrook JT, Wise RA, Gold BD, et al., Lansoprazole for children with poorly controlled asthma: a randomized clinical trial, JAMA, 2012;307:373–81. 10. Martin ME, Grunstein MM, Larsen GL, The relationship of gastroesophageal reflux to nocturnal wheezing in children with asthma, Ann Allergy, 1982;49:318–22. 11. Gustafsson PM, Kjellman NI, Tibbling L, Bronchial asthma and acid reflux into the distal and proximal oesophagus, Arch Dis Child, 1990;65:1255–8. 12. Cinquetti M, Micelli S, Voltolina C, et al., The pattern of gastroesophageal reflux in asthmatic children, J Asthma, 2002;39:135–42. 13. Parsons JP, Mastronarde JG, Gastroesophageal reflux disease and asthma, Curr Opin Pulm Med, 2010; 16:60–3. 14. Harding SM, Richter JE, The role of gastroesophageal reflux in chronic cough and asthma, Chest, 1997;111:1389–402. 15. de Benedictis FM, Carnielli V, de Benedictis D, Aspiration lung syndrome, Pediatr Clin North Am, 2009;56:173–90. 16. Asher MI, Montefort S, Bijorksten B, et al., Worldwide time trends in the prevalence of symptoms of asthma, allergic rhinoconjunctivitis, and eczema in childhood: ISAAC Phases One and Three repeat multicountry cross-sectional surveys, Lancet, 2006;368:733–43. 17. Dent J, El-Serag HB, Wallender MA, et al., Epidemiology of gastro-esophageal reflux disease: a systematic review, Gut, 2005;54:710–7. 18. de Benedictis FM, Bush A, Problematic severe asthma in children: the Pandora’ box, Eur Respir Dis, 2011;7:91–6. 19. Gibson PG, Henry RL, Coughlan JL, Gastro-oesophageal reflux treatment for asthma in adults and children, Cochrane Database Syst Rev, 2003;2:CD001496. 20. Kiljander TO, Harding SM, Field SK, et al., Effects of esomeprazole 40 mg twice daily on asthma: a randomized placebo-controlled trial, Am J Respir Crit Care Med, 2006;173:1091–7. 21. Mastronarde JG, Anthonisen NR, Castro M, et al., Efficacy of esomeprazole for treatment of poorly controlled asthma, N Engl J Med, 2009;360:1487–99. 22. Stordal K, Johannesdottir GB, Bentsen BS, et al., Acid suppression does not change respiratory symptoms in children with asthma and gastro-oesophageal reflux disease, Arch Dis Child, 2005;90:956–60. 23. Fitzpatrick AM, Holbrook JT, Wei CY, et al., Exhaled breath condensate pH does not discriminate asymptomatic gastroesophageal reflux or the response to lansoprazole treatment in children with poorly controlled asthma, J Allergy Clin Immunol Pract, 2014;2:579–86. 24. Condino AA, Sondheimer J, Pan Z, et al., Evaluation of gastroesophageal reflux in pediatric patients with asthma using impedance-pH monitoring, J Pediatr, 2006;149:216–9. 25. Kiljander TO, Junghard O, Beckman O, Lind T, Effect of esomeprazole 40 mg once or twice daily on asthma: a randomized, placebo-controlled study, Am J Respir Crit Care Med, 2010;181:1042–8. 26. Vela MF, Camacho-Lobato L, Srinivasan R, et al., Simultaneous intraesophageal impedance and pH measurement of acid and nonacid gastroesophageal reflux: effect of omeprazole, Gastroenterology, 2001;120:1599–606. 27. Rantanen T, Kiljander T, Salminen P, et al. Reflux symptoms and side effects among patients with gastroesophageal reflux disease at baseline, during treatment with PPIs, and after Nissen fundoplication, World J Surg, 2013;37:1291–6. 28. Mattioli G, Sacco O, Repetto P, et al., Necessity for surgery in children with gastrooesophageal reflux and supraoesophageal symptoms, Eur J Pediatr Surg, 2004;14:7–13. 29. Deal L, Gold BD, Gremse DA, et al., Age-specific questionnaires distinguish GERD symptom frequency and severity in infants and young children: development and initial validation, J Pediatr Gastroenterol Nutr, 2005;41:178–85. 30. 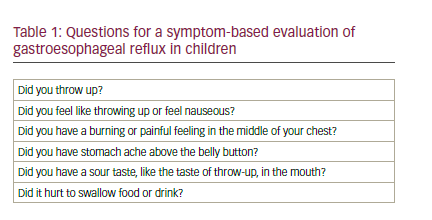 Nelson SP, Chen EH, Syniar GM, et al., Prevalence of symptoms of gastroesophageal reflux during childhood: a pediatric practice-based survey. Pediatric Practice Research Group, Arch Pediatr Adolesc Med, 2000;154:150–4. 31. Lambert AA, Lam JO, Paik JJ, et al., Risk of communityacquired pneumonia with outpatient proton-pump inhibitor therapy: a systematic review and meta-analysis, PLoS One, 2015;10:e0128004. 32. Lau AN, Tomizza M, Wong-Pack M, et al., The relationship between long-term proton pump inhibitor therapy and skeletal frailty, Endocrine, 2015;49:606–10. 33. Martinez FD, Children, asthma, and proton pump inhibitors: costs and perils of therapeutic creep, JAMA, 2012;307:406–7.